Solar Energy is not only the future of Clean and Renewable Energy, it is the Present. Today, Californians all around the state are reducing their Electric Energy usage by significant numbers. So why join the masses and convert to Solar Energy? Along with the few reasons listed on our Home page, we dig down deeper to look at Solar Energy and the benefits that come along. 1. When you convert your home or business to Solar Energy, you are reducing your dependence of Fossil Fuels. Fossil Fuels must be burned to produce Electricity. The burning process creates negative byproducts that end up in our air and water. With this Air Pollution and Water Pollution, we are conversely effecting ourselves and our future generations. Solar Panels, when used, produce a completely Clean form of power - with no waste and no emissions. The process in which this natural clean process takes place is called Photovoltaics. Fossil Fuels are scattered and restricted. The pursuit of Fossil Fuels around the globe has lead country's to war, as well as arguments locally which have led to labor strikes. Wherever the Sun is, there is Solar Energy. It is practically available everywhere, and will be for a very long time. Energy from the Sun is Infinite and Free. When harnessed properly, it can be converted into Power fueling your home for years to come. 2. There are a large number of Environmental Advantages when using Solar Energy. Photovoltaic Panels, along with the hardware that is needed to install a Solar Powered System, are technical and high-tech. Installation and Creation requires resources and labor to accomplish the job. But when you compare that to the intense processes involved with mining for coal or drilling for oil, there is no question that Solar Power is Cleaner, more Available, and Long Lasting. According to the International Panel on Climate Change, as described by the scientific advocacy group, Union of Concerned Scientists, coal and natural gas generate between 8-51 times as many greenhouse gas emissions as home solar. The Oil Spills of Exxon Valdez, Deepwater Horizon, and Lac-Mégantic are just a few examples of how devastating Fossil Fuels can affect our Environment. These events are not intentional, purely accidental, but that doesn't stop them from occurring over and over. Currently in North Texas and Oklahoma, Fracking is allegedly causing an outbreak of earthquakes in areas with no distinct or dangerous fault lines. Solar Energy is Low Impact on our Environment in terms of negative affects. 3. 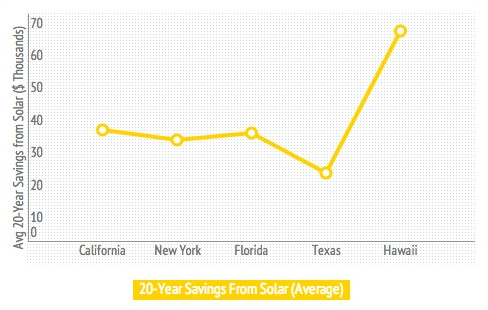 Solar Power can match your Peak Time Output with your Peak Time Demand. Imagine it's afternoon on a hot and sunny day in August. Your air conditioner's compressor is running at full capacity, and it still feels hot in the house. Now multiply that scenario over a period of 4 weeks, and then imagine looking at your Electricity Bill. What if you could filter in Energy from the Sun to power your Air Conditioning Unit during the hottest part of the day, month, and year? Whatever your Peak Time Demand for Energy is, a Solar Powered System can match that amount of Output. Image your Electric Bill now. Solar Power supplements the electricity from the grid, during the hot summer months, and frankly, year round - whenever the sun is out. This allows for your Electric Provider to save energy, and you to save money. 4. Residential and Commercial Solar Unit owners can receive Government Incentives. The solar power market continues to grow today at outstanding rates. After California passed the California Solar Initiative, Californians began going green, making an incredible impact in our Fossil Fuel usage amounts.